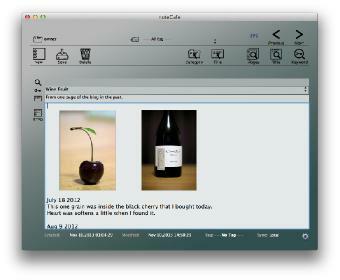 The noteCafe is the application that can easily record a Web page or a memos. The noteCafe supports iCloud and Local. Using iCloud, you will be able to share data between your Mac. Also, using Local, you will be able to manage data in only Mac you are using. The noteCafe manages the data in order of a creation date. Many people remember the approximate day when self recorded data. When you find data from an approximate date, noteCafe will be useful. Large classification uses the category. Small classification uses the tag. Pages are sorted by date created. Filter is using the create date and update date. noteCafe has a search function of three types. The tag can attached to the page. Display the category list. Click on the category. Displays only pages that belong to that category. Category can create, edit, and delete. Category can be selected in local and iCloud. Display the title list. The page is displayed when you click the title. Title List is a page that matches the categories and tags. Pages are sorted by date created. Filter by the create date and update date. You can use the appearance of the modern two-color type. Search results is displayed in a separate window. Page is displayed when click its title. Subject to search is the page that matches the categories and tags. Subject of search are the page and the title and keywords. Search results is filtered by the create date and update date. Also, support the AND-search. Title and keywords will be attached to the page. The tag is attached to each page. The preservation of data can use iCloud and Local. Every category can choose iCloud and Local. The noteCafe is limiting the file size to be saved to iCloud. There is no limit to local. The noteCafe support a "AND-search". The narrowing by creation date. Can narrow the search results list and title list in the range of creation date. The narrowing by modification date. Can narrow the search results list and title list in the range of modification date. Page will be exported in RTFD format. can share a page between plural Mac by using this function. The noteCafe support the service function that Apple Inc. provides. 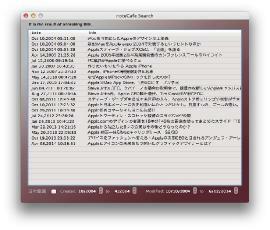 Export and import of the noteCafe file. Can move exported noteCafe file to new Mac by using the import function. When an index necessary for the operation of noteCafe is damaged by some kind of accidents, the noteCafe can rebuild an index. The noteCafe does not support the auto-save feature of iCloud. When you saved it with a save button, the editing page is sent to iCloud. 1. Share extension has been updated. When capturing images using the shared extensions big picture will resize. Map application will be captured as an image. Corresponding to the screen size of noteCafe of IOS version. 1. Fixed a bug where the shared extension cannot be imported the Web page. Url of http domain fixed a bug that not be imported. 1. Support the El Capitan. 2. Fixed a bug that update date is changed when change the Tag or Category or Keyword. There was that it may not be imported the contents depending on the Web page. 2. Add search function in the search results list and the title list. You can search the title and creation date from the list. 1. Supports the iCloud Drive. Using a supported iCloud Drive in Yosemite, you can share files of the noteCafe. 2. Supports the markup function. Using the markup features that are supported in Yosemite, you can be written comments to the image. 3. Supports the share extensions. Using a shared extensions that are supported in Yosemite, you can send the information easily to noteCafe from other applications. 4. Type of appearance will be only the modern type. 1. Fixed a bug when carried out file update of iCloud. 3. Title list was modified in a separate window from the seat window. 4. Appearance of the default has been changed to modern type. Copyright © 2004-2015 in-bluesky. All rights reserved.